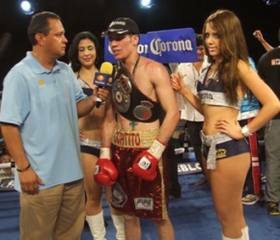 Mexican Hugo "Cuatito" Ruiz of Los Mochis, Sinaloa México, one of the hardest hitting fighters in the bantamweight division, retained for the fourth time his WBA interim title by knocking out Nicaragua's Jean Sampson at the end of round 9 in La Paz, Baja California, México. The challenger Sampson was game, willing to engage and managed to land some good shots and combinations on el "Cuatito," but the Mexican was the dominating warrior throughout the combat. The fight went on at an entertaining pace with Sampson never backing away from fire exchanges in his attempt to capture Ruiz's crown, till a devastating left blow by the end of round nine was the the bomb that sent the Nicaraguan down to end the battle. With the victory, Hugo "Cuatito" Ruiz, who scored his KO #28 in 31 victories, with only one defeat, vows to continue defending his WBA interim title against the best in the bantamweight division where the regular WBA regular champ is Japan's Koki Kameda and the WBA "super" world champion is Anselmo "Chemito" Moreno (33-1-1, 12KO's) of Panama. Photo: WBA interim champ "Cuatito" Ruiz being interviewed by Mexico's Televisa after knocking out Jean Sampson.